Welcome . If you are not Please Login or Register. Forgotten Password? 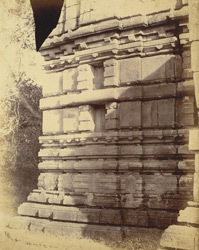 Photograph of the large temple at Khalari, Raipur District taken by Joseph David Beglar in 1873 or 1874. Khalari is located in the modern state of Madhya Pradesh. The town is home to several temples, most of which are now in ruins. The shrine pictured here is the principal monument of the town. Shortly after this photograph was taken J.D. Beglar reported that, "The temple is Saivic, and a figure of Ganeça keeps watch over the entrance, which faces east. The temple is particularly plain, by which I mean devoid of sculptured ornament; but the exterior is enriched by plain bold mouldings and surmounted by rows of massive plain tablets in place of the rows of statues of the Khajuraha temple. The general outline is very graceful; the rows of blocks which here occupy the place of rows of statues are surmounted by a bold, deep-throated cornice, over which rise the tower proper." You must log in to see your favourites. Tick box or boxes to add this item to your personal galleries. You must log in to create and edit galleries. What is the nature of your concern?